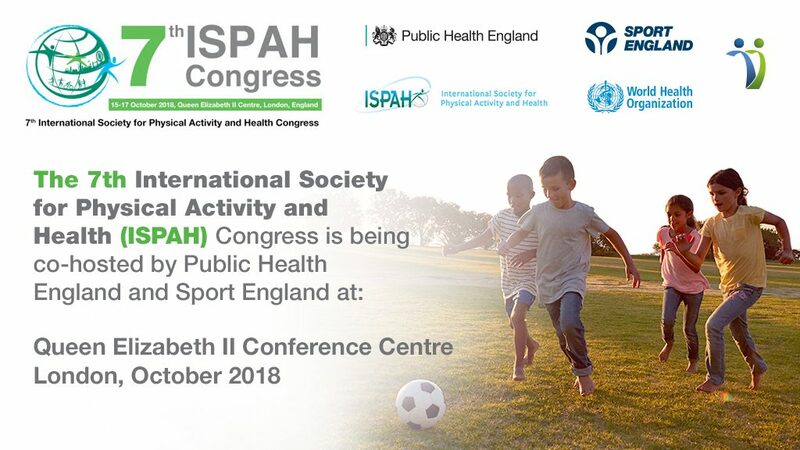 Next week sees the seventh International Society for Physical Activity and Health Congress (ISPAH) come to England on 15-17 October 2018. As we approach the ISPAH congress, we take stock of how far we’ve come in the journey towards increasing physical activity in every level of society. This year’s congress coincides with the 65th anniversary of Jerry Morris’ seminal London transport workers study which first highlighted the connection between physical activity and health. Jerry Morris found that bus conductors had a lower incidence of coronary heart-disease than bus drivers because they were physically active while the drivers were sedentary. Despite our increased understanding of the importance of being active, recent World Health Organisation (WHO) data shows that inactivity stubbornly remains a global issue for today’s society and England is no exception. The UK Chief Medical Officers’ guidance highlights the potential for active individuals to have lower risks of over 20 common health conditions, including cardiovascular disease, depression and type 2 diabetes. Inactivity also costs the UK around £7.4bn each year, including up to £9.4m to each NHS CCG in England for five preventable diseases - ischaemic heart disease, cerebrovascular disease, breast cancer, colon cancer and Type 2 diabetes. With people living longer, early intervention is needed to make sure physical activity is accessible and efforts go a long way to prevent ill health for everyone. This will not only lead to a healthier, fitter society, but it will have an economic impact, reducing the amount the NHS spends on treating preventable diseases. The ISPAH Congress, co-hosted by PHE and Sport England and sponsored by the WHO, brings together over 1,000 leaders from research, policy and practice to discuss to discuss key challenges for increasing population physical activity. It presents a timely opportunity to lead the discussion around physical activity and health. The WHO’s recent publication of the Global Action Plan on Physical Activity (GAPPA), designed to help countries improve policy actions to promote increase physical activity globally, sets the direction globally. Here in England, PHE is taking this challenge seriously and is already working within the framework of this plan to improve the health of the nation. 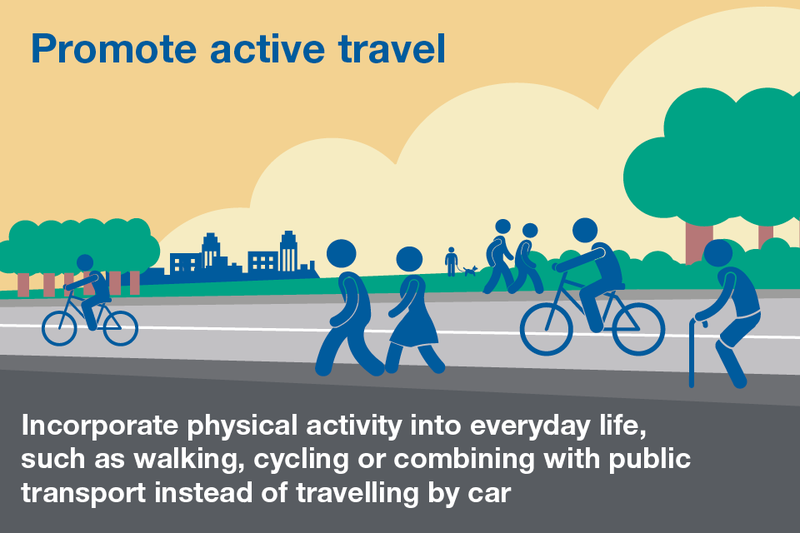 In 2014, PHE co-produced the national physical activity framework for England, Everybody Active Every Day, based on international evidence of what works to increase population level physical activity with over 1,000 local and national leaders. Its four domains align closely with the four GAPPA objectives and will aid our commitment to support and delivering against the WHO plan across England. Societal attitudes shape our view of health and how to stay healthy. Physical inactivity has increased since the 1960s due to societal changes and more sedentary lifestyles. This is why we continue to provide leadership to change social norms and attitudes towards physical activity and make being active the easy choice. By using insight-led social marketing, such as the Change4Life ‘Train like a Jedi partnership with Disney UK, we incentivise children and families to follow in the footsteps of their favourite characters and be more active whilst having fun. We have also harnessed society’s need for technology to integrate physical activity into people’s everyday lives with the One You Active 10 and Couch to 5k apps. The environment we live in has a crucial role to play in our attitude towards physical activity. Recognising the power that environments have in shaping our behaviours, we have partnered with the built environment and transport sectors through our Healthy Places programme. Work includes a Memorandum of Understanding with some of the country’s leading housing developers committing to embedding health and wellbeing initiatives in new housing developments and working with NHS England on its Healthy New Towns programme. We are also bringing place making agendas together to better facilitate sustainable changes, including providing evidence on creating Healthy High Streets that are inclusive and contribute to health and economic gains of local communities. This work will ensure that physical activity and broader health and wellbeing strategies are factored into planning for housing, towns and communities. There are a range of different sectors within which professionals and volunteers have a unique opportunity to encourage and support people to become more physically active. We have developed a national Moving Healthcare Professionals programme with Sport England and other system leaders to support healthcare professionals develop the knowledge, skills and confidence to embed physical activity within clinical care. This includes the PHE Physical Activity Clinical Champions programme, which has a national network of more than 40 healthcare professionals who have already delivered practical, peer-to-peer training to over 20,000 practicing healthcare professionals. Schools are central to embedding healthy behaviours early on in life. We have worked with the education sector to develop ‘What Works in Schools and Colleges to Increase Physical Activity?’. Aimed at head teachers, this resource helps them increase levels of physical activity among children and young people, links to Ofsted inspection criteria and signposts useful sources of support to bring policy into practice. In addition, we have also produced an evidence review of strength and balance activities for general health benefits, commissioned with the Centre for Ageing Better, to reinforce forgotten guidelines that professionals can use to inform their advice to individuals and help keep people healthier for longer. Getting the nation moving more relies on a range of initiatives implemented across the system, not just focused on health. As the statutory leader of the public health systems, we have worked to strengthen leadership, governance, advocacy and information across sectors to increase physical activity and reduce sedentary behaviour. Following Everybody Active Every Day we have supported national government to embed its principles across a matrix of policies and commitments to get the nation more active, including: the Sport Strategy; Cycling and Walking Investment Strategy; and Childhood Obesity Action Plan. We have also supported action at local level, with the breadth and depth of action by local government and other stakeholders exhibited in the latest national implementation review. It’s important that positive change is measurable, permanent and consistent in order to improve its impact. We are enabling this through a data tool of the latest local physical activity datasets. Getting the population more active requires long-term persistence and collaboration and no single intervention or organisation can respond to or solve the challenge alone. We need to take a whole systems approach to physical activity like we are doing with our obesity pilots and supporting partners like Sport England on their Local Delivery Pilots to make this happen. We also need to make sure physical activity is inclusive of everyone in our society. At ISPAH we will also be launching the world’s first evidence review of its kind looking specifically at physical activity for general health benefits for disabled people – some of whom have the lowest levels of physical activity within the population. Next week’s congress provides an opportunity to share and learn from international counterparts, which we hope will help increase the pace and scale of change at local and national levels and help to encourage a more active and healthier nation. We all need to exercise. There is a way for all of us.